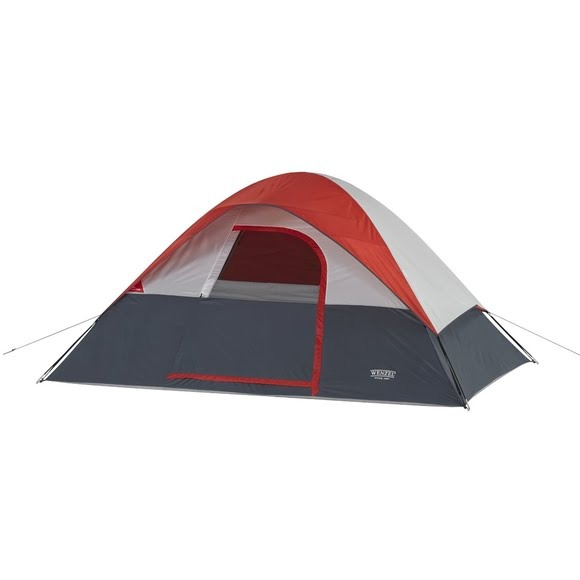 Perfect for car camping, Wenzel's 10x8 Dome is an easy-to-set up and highly durable 5-person tent with useful features. Gear loft and internal convenience pocket plus a E-Port for electrical cord access. There's also a zippered rear window with a privacy flap and mesh roof vents for airflow. So you'll have a great experience no matter where you set up camp. Perfect for car camping, Wenzel &apos;s 10x8 Dome is an easy-to-set up and highly durable 5-person tent with useful features. Gear loft and internal convenience pocket plus a E-Port for electrical cord access. There&apos;s also a zippered rear window with a privacy flap and mesh roof vents for airflow. So you&apos;ll have a great experience no matter where you set up camp. Stuffed Size 26" x 8"